It's evening, the atmosphere is cool and damp, the only audible sounds are slimy, unctuous noises. The entire surface of this swamp is scattered with gold stars, ancestors caught in the surface tension. An astronaut exploring this mysterious landscape climbs into an abandoned cast iron claw-foot tub, a retired relic in murky (water? ), a useless boat, no longer curious for adventure. She notices through her protective suit that the bath water feels different than the rest of the swamp. It's a little warmer, the temperature a memory of a bath long ended. 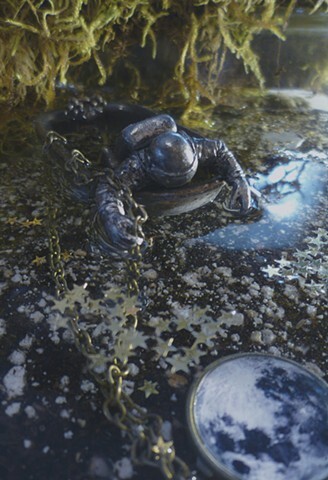 She takes a few samples from the site preserved in test tubes for study, then finds a chain from the tub drain tethered to some patient treasure... the sunken moon. She pulls and drags the full moon and unleashes its cold round body. The astronaut frees the moon, it's glow now visible, into the night sky.